Marriage or your kids…which should be your priority? Today we are going to see what the Bible has to say about this topic! Let’s face it, time alone with your spouse is something most couples are lacking, especially when kids are in the picture. Before we can spend time with our beloved, the tasks of the day must be finished, housework and schoolwork need to be completed, baths and story time must be done. And all this before you can think about having a conversation without interruption or watch a movie that doesn’t include super heroes or singing princesses. Oftentimes by the time the day’s tasks are done, sleep is the only thing on your mind, and your alone time is simply crawling into bed together exhausted. Yet, is this the picture of marriage that we want to show our kids? Did God really design our marriage relationship to be second in importance after our relationships with our children? In Ephesians 6 God gives direction to children and to parents. Our children are gifts and a responsibility that God has given us, so we must ensure that we are being the parents God calls us to be. We also must be diligent and ensure that our marriage is the priority according to God’s design. The directions from the Lord to parents are that we are to train our children and raise them as unto the Lord. The instruction for our marriage is to draw near to God and each other; to become one flesh. How can we become one flesh if we place our relationships with our children in priority? 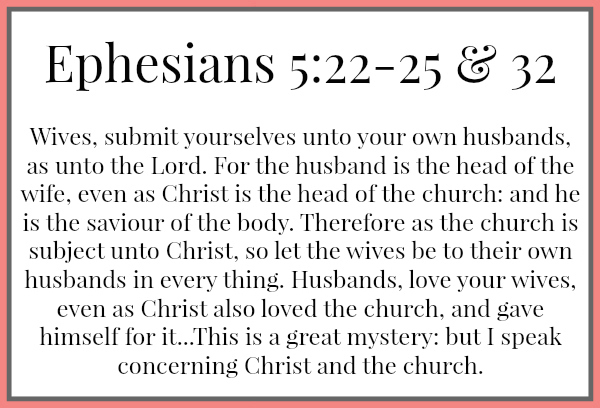 Our marriage relationship is to be likened to Jesus’ relationship with the church as Ephesians 5:22-25 & 32 states. While our marriages will never be perfect without spot, wrinkle, or blemish, we must ensure that our marriage is a priority to us just as we are a priority to Christ. The beautiful relationship that we as the church have with Christ is available to us in our marriage if we follow God’s design and instructions. If your marriage relationship is struggling or if you’ve had your priorities mixed up, take some time to seek the Lord’s specific direction for you and start following the basic instructions He’s given you in Ephesians 5 and 1 Corinthians 7. Don’t be discouraged if your marriage relationship is not where you’d like it to be. A relationship goes through ups and downs in life; it’s the growing together through these times that begins to create a marriage as designed by God. How do you ensure your marriage is your priority? What makes it hard for you to keep your marriage the priority that it must be? Misty is a Daughter of THE King, Texas girl always, Navy brat at heart, loving Fisherman’s wife, blessed mother of 2 and author of Beautiful Ashes. She is passionate about being real throughout all of life’s struggles, successes and dreams. Her heart is full of ideas and passions, but the hours in her day never multiply to get it all done. Misty loves writing and reading in her spare time. Music and photography are favorite past times of hers as well. You can find her on Facebook, Twitter, Pinterest, G+ and Blog Lovin. That is so wonderful! We truly must carve out time for each other to ensure our marriage is our priority. It is so very easy to get caught up in the day to day tasks and miss out on the most important relationship in our lives (aside from Christ)…each other! Praying God’s continued blessing on your marriage Rosann! This is so true – and something I struggle with. I feel like I’m spent after a full day with my kids. It’s a challenge to not over-devote myself to my kids. This has been a major area of re-prioritization in my life! Thank you for this timely reminder, friend! Yes, it is something that I struggle with too friend! I know in my head and in my heart that my husband and I need time alone together, but after our long days we’re exhausted and just ready to go to bed. I strive to be focused on him when he is home during the day while I’m busy doing other things, ensuring that if he needs my help or just wants to talk that I put everything else aside and make our building/growing our relationship priority. This is so true, Misty! We often think that by putting our marriage first, our children will be lacking when the truth is that our children are blessed when our marriage comes first. We are able to provide them with a happy home and a wonderful example. Yes! Exactly! Our children will be blessed with knowing that their parents love each other and they’ll be blessed by knowing what a Godly marriage is supposed to be and look like! Blessings Heather!